Design type T38: View on Acre (Akka) (100, 200, 500m, and £P1). 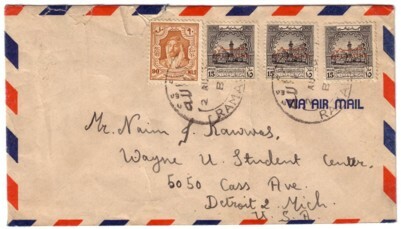 In addition to normal postage costs, half the postage value had to be put on letters using such obligatory tax stamps. These funds were initially directed to the aid fund for Palestine. From May 1951 all such generated income went into the general budget, earmarked for reconstruction and development. Obligatory tax stamps SG Nos. 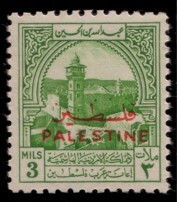 PT36 und PT37 (together with definitive stamp SG No. P7) on piece. Cancelled by RAMALLAH / B / 1 AU 50 (Wallach R.1.6). 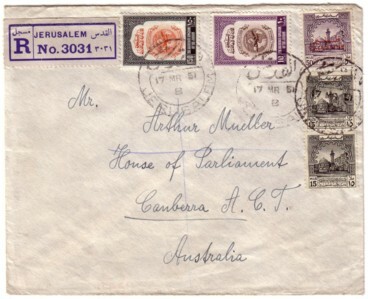 Registered letter from Jerusalem to Australia: Jordan SG no. 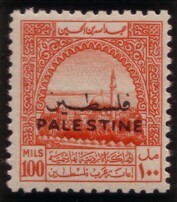 301, 296 and Jordan obligatory tax stamp (vertical pair) SG no. T269 mixed with Palestinian overprint value SG no. PT42. Postmark JERUSALEM / B / 17 MR 51 (Wallach J.1.5). On reverse transit marks BEYROUTH [2?] / CHARGEMENTS / 23 III 51, AÉROPORT [...] / RA 1 / 24-3-51[...], and arrival marks Sydney and Canberra. 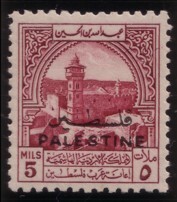 Until special stamps were issued for the West Bank, normal Transjordan stamps were used in Arab-controlled areas. The same is true for obligatory tax stamps. 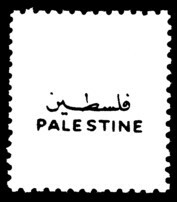 On 5.10.1948, two months before overprinted postage stamps were issued, obligatory tax stamps special to the West Bank came into use. The Transjordanian obligatory tax stamps (design types T36, T37, and T38) were overprinted in black and red with type PT4. 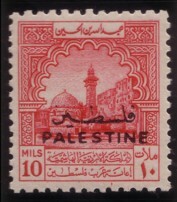 After incorporation of the West Bank into (now) Jordan, only Jordanian stamps were used. After 24.04.1950 the overprinted stamps could be used up (until December 1950). 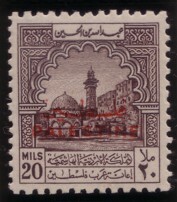 Jordan issued a number of obligatory tax stamps series; after introduction of the new currency also in "Fils". 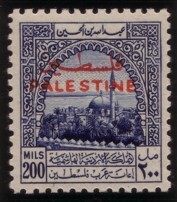 The obligation to use these stamps was lifted by law for 31.12.1951. According to catalogue Michel this decision was not publicised until 16.01.1952. Due to stamp shortages, many Jordanian obligatory tax stamps were later used as regular postage stamps, including those overprinted for Palestine. Between 1953 and 1956 some were issued with an additional overprint "POSTAGE". 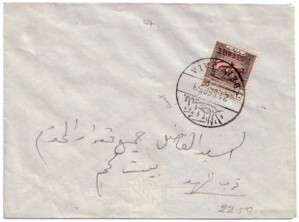 Letter from Beit Jala to Bethlehem franked with Jordan SG no. 392. 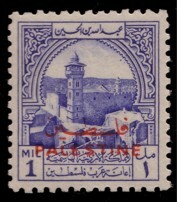 Postmark: BEIT JALA / 21 SEP 58 (Wallach B.2.5, with slightly shortened P). On reverse arrival mark BETHLEHEM / 2 / 21 SEP 58 (Wallach B.1.7).